"Far from the range, buffalo hair, newly pantented and soft as cashmere, is the rage." In this synthetic age of ultrastretch lycra and wrinkle-free microfibers, Ruth Huffman, right, says she has discovered the newest wonder fabric and that it is 100 percent natural. You can throw it in the washer and dryer, and not only will in not shrink or wrinkle, she says, it comes out feeling like cashmere. Through the ages textile workers have made fabric from all manner of animal hair - including hog and kangaroo. But Ms. Huffman appears to be the first to have patented a way of knitting fabric from buffalo hair. Last month she received United States patent 6,385,954. In the early 1990's, Ms. Huffman then a homemaker and the mother of three nearly grown children, was going through a divorce and was in search of a profession. So she began making clothes for the wealthy women of Dallas and showing and selling her creations successfully through trunk shows, earning a mention in Women's Wear Daily. Then in 1994, Ms Huffman read a National Geographic article about the growing herds of American buffalo (more correctly called bison), which were making a comeback after nearing extinction at the end of the 19th century. Why not try making clothes of bison hair, she thought. 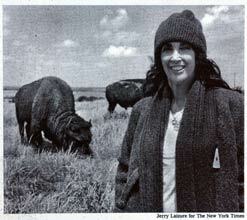 Through the National Bison Association, she found a rancher in Colorado who was selling 1,000 pounds of hair. When she shared her idea with Doug Adkins, the husband of a friend and a fellow parishioner at First Baptist in Dallas, he wrote a check to buy and process the bison hair. "Ruth was a person who was extremely talented and needed push in life," Mr. Adkins is a partner with Gardere, Wynne, Sewell, a prominent law firm in Texas. So Ms. Huffman negotiated a price and had U.P.S. pack up the bison hair and ship it to Dallas. "It was probably one of the most unusual shipments U.P.S. has had to make," Ms. Huffman said. She had the hair cleaned and spun into yarn, which she then knitted into custom clothing for clients. Ms. Huffman said she hoped to reach a broader market with scarves and mittens and knitted caps and is in the process of securing financing for a textile mill of her own devoted solely to processing and knitting buffalo hair. Native Americans originally stuffed pillows with bison hair and plaited it to make ropes. But it didn't occur to them to weave or knit it until frontiersmen showed them how, according to Ms. Huffman, who says she has native American ancestry. "It's been done by hand before, but I'm the first one to ever put this together commercially," she said. Ms. Huffman acknowledges that she does not yet offer a wide range of colors for her creations. She is experimenting with a proprietary process to make a cream-color version. Otherwise, however, clients can have any color they want - as long as it's chocolate brown.